Increases in capital expenditures historically have a direct correlation to revenue at Apple, and a recent spike in spending suggests the company is set to deliver a record quarter of at least $56.4 billion in revenue this holiday season. Excluding retail stores, Apple expects to spend $7.2 billion on capital expenditures in its 2012 fiscal year, which implies over $3 billion in capital outlay for the remainder of the company's fiscal year. Apple's spending spike means the company is poised to deliver a massive, record quarter later this year, said Katy Huberty, analyst with Morgan Stanley. 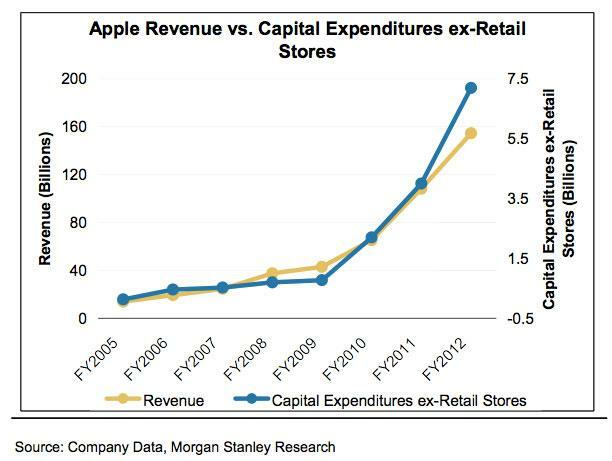 "Apple's revenue and capex ex-retail stores have been 97% correlated over the past seven years and the acceleration in capex growth signals a similar acceleration in revenue growth, in our view," Huberty wrote in a note to investors this week. She believes Apple is in the process of purchasing tools and machinery for new production processes, as well as added capacity at its suppliers. This suggests the company is planning to ramp up production significantly for new products, such as an anticipated next-generation iPhone or smaller iPad. Huberty's forecast currently calls for Apple's revenue to reach $56.4 billion in this year's holiday quarter. Based on historical trends, Apple needs to allocate only $1.8 billion of its implied $3 billion of capital expenses in the current quarter to reach that revenue estimate. Investments outside of new product production, such as Apple's ongoing data center expansions, are not likely to represent a majority of the company's capital expenditures, Huberty said. Therefore she believes the $3 billion in expenses planned by Apple in the current quarter suggests a likely upside to her forecast of $56.4 billion in revenue for the holiday 2012 quarter. Apple's best-ever quarter came in the holiday shopping season of 2011, when the company earned $46.33 billion in quarterly revenue and $13.06 billion in net profit. With the presumed launch of the new iPhone this fall, along with other potential products, Apple is poised to easily exceed its previous record. Huberty is the second analyst this week to pick up on Apple's growing expenses. Maynard Um with Wells Fargo Securities noted on Monday that Apple's component prepayments increased by $1.15 billion sequentially in the June quarter. He also noted that Apple's increases in inventory component prepayments have been followed by "a solid ramp-up in revenue" in the proceeding two or three quarters.